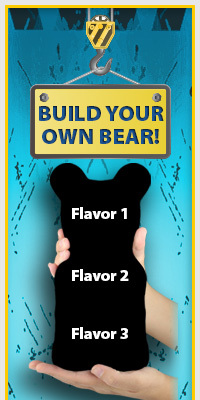 How do you eat the World's Largest Gummy Bears!™ ? At over 1,000 times the size of a regular gummy bear this big beauty can be challenging to eat. World's Largest Gummy Bears!™ comes wrapped in a food safe bag which will help your gummy stay fresh. Cool it in the fridge then cut fine slices with a knife (kids, get your parents to help). This is a great way to enjoy your gummy piece-by-piece and make it last. Serve it as hors d'ouevres at a party. Warm it up in the sun and have a stretch tug-of-war with a friend. Oh, it's GOOD! Our family recipe and careful craftsmanship results in gummy bears that are full of delicious flavor. When you open the bag the aroma of the bear fills the room. We use only the best ingredients to make sure every ounce is good to eat. Yes. We are always interested in talking with store owners. Please call or email to talk with us about the details. Some ingredients are produced in a facility that processes peanuts, tree nuts, soy, wheat and milk products. Can I pay for my order with an e-check on Paypal? Are there any items not eligible for USPS Flat-rate shipping? While we strive to process all of our orders as quickly as possible, please allow us 24-48 hours to fully process your order. Yes, an email will be sent out to the email address provided on your order with your tracking number once your order is complete. We do ship internationally with both FedEx and the US Postal Service. The recipient is responsible for all duties and taxes upon receipt of the package. We do accept e-checks through Paypal and your order will be sent out once the e-check clears. The time it takes for an e-check to clear is typically 3-5 business days. While we offer a variety of shipping methods to meet your needs, the normal shipping time in the US is usually 1-5 business days depending on the order's final destination. All orders are shipped from our facility in Raleigh, North Carolina. Products that are not eligible for flat rate shipping are also identified in their product description.